The fairest of the fair. My fading flower of forgotten love. John Crowley (author of the AEgypt Tetralogy) has mentioned several times in his books a curious list: dogs, stones, stars, and roses. What can he mean by this? I propose this is a metaphor (Meta-four?) 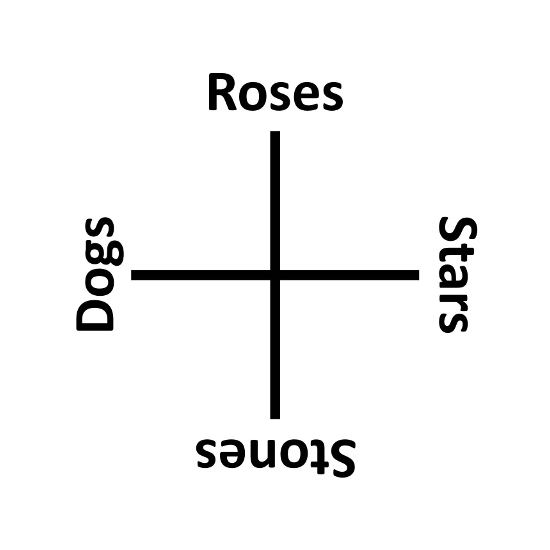 for the four colors of the Magnum Opus: yellow dogs, black stones, white stars, and red roses. At least until I find out otherwise!